Their Christmas Wish: Generous Hands, Both Kinds. My mail box is full of sale ads from every tack store on the planet this time of year. Someone who works in advertising is telling me what my horses want for Christmas. None of us here are that easy to shop for. I see that they now make patent leather bridles. My mother made me wear tight patent leather shoes to church when I was little. I don’t think I could do that to a horse. Mine aren’t that church-y. There are new winter blankets that look like vintage flowered bedspreads. Do manure stains show less on a pattern? It doesn’t matter; our blankets have family hand-me-down karma, worn by the last generation of good Infinity Farm horses. Except for the Grandfather Horse who still wears the winter blanket made for him 25 years ago. It’s patched and faded, but broken in just the way he likes it. When he has no more use for it, I’ll put it on another horse. I’m pretty sure it has healing qualities. But you actually know that horses don’t care about this kind of stuff, right? They care about you, they care about relationship. It’s more likely that their holiday lists include things you can’t buy in a store. The usual equine requests include, “Could you help my rider get that cinder block out of her pants and loosen up some in the saddle?” Or “Please, let my rider breathe a little deeper, she’s squishing my ribs.” But the number one request is always the same: “Dear Santa, please bring my rider better hands.” If they sold those at Dover or SmartPak, we’d all charter a bus and go today! Is anything harder to learn than soft, connected contact? If we ride with our bodies; with seat and legs doing the cuing, then I like to think we use the reins to listen to our horse. Reins and bits should never be used for correction, just for suggestion. We humans have definitely gotten hard in the mouth about bits (see Metal on Bone.) Too many of us are not aware of how much we pull on the reins; stiff elbows create stiff horses. No horse will ever be happy as long as his rider has a death grip on the reins. 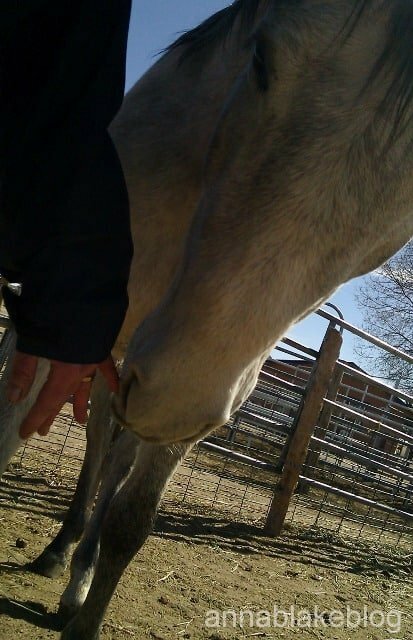 We need to develop soft, breathing hands, steady in contact, yet fluid with the horse. Generous hands. If you want your horse happier, maybe the best gift for your horse this holiday is an investment in your skill. A little coaching from the ground might help you hear better with your hands. I think riding is one of those things that’s pretty difficult to learn from a book, and videos aren’t much better. And like most relationships, communication can always improve. Back to shopping; it’s true that when it comes to spending money there’s nothing I enjoy more than shopping for my horses. But we have hay enough, and all of us are pretty good at wanting what we have. Even Clara, the young mare, sees no need to gild the lily. We should all have her confidence. If anything, I would buy what we have for other horses. Today, I was handing a couple of horses off to Pat from Ruby Ranch Horse Rescue, and she told me they are getting ready to go try to help an emaciated elderly horse. He’s no longer ride-able, his family has fallen on hard times, and he needs help soon. I keep thinking about him; the wind is blowing cold tonight. And I know he is not the only elder lost in neglect, (Walter says, old dogs too.) My Grandfather Horse has shelter and lots of hay. His age has some dignity to it, at least he is safe in our herd. We’ve got what we need here, I think I’ll spend my money at Ruby Ranch. I’m not bragging, I never give as much as I wish I could. I’m just suggesting, like a kind hold on the reins: if you are dreaming of horses this holiday, use your generous hands to put a big red bow on an old campaigner, past his usefulness. Because it’s never too late for him to become a Christmas Pony! Please give a little or a lot to your local horse rescue, or mine- Ruby Ranch. Ruby Ranch Horse Rescue is a federal 501(c)(3) Non-Profit Organization charity and is registered as a non-profit in the State of Colorado. Our EIN is 35-2242211. What a wonderful thought for Christmas! My pampered horses really don’t need anything — I will give, instead, to charity. My own personal choice is http://www.canterusa.org. It helps Thoroughbreds transition into non racing homes and it is where I got Freedom. Time to make a donation in his name. I love this idea. Since so many of our pampered horses don’t really need anything (except a more skillful rider!) now is a great time to make a donation to your favorite horse charity. My own personal favorite is http://www.canterusa.org. CANTER helps retiring racehorses find non racing homes. I got Freedom from them and have also fostered a few horses. They do a wonderful job and, since the organization is staffed by volunteers, all the money you donate goes to the horses. I’ve only just started reading your posts, and I really like what you have to say. I blog, too, so I know that you didn’t write this in 5 minutes between barn chores! Lots of effort goes into it. I’ve shared on FB. Here’s to old horses in cozy blankets. I have a new horse as of Dec 1! He’s young, turning 8 in February. I hope to have him until he’s hobbling around (as I will be in 20 years.) I blog at http://www.HenCam.com. Like you, I write about relationships with our animals, but along with horses, I’ve got chickens and goats (and of course, dogs) in the mix. Generous hands are the best present ever, for all concerned. Lovely post! Amen. Well said.As St. Francis said, it is giving that we receive.Blessing to you and the herd.